Dr. Bill Kotonias is a dentist, entrepreneur, and mentor for several up & coming entrepreneurs. On this week’s episode, we discover how Dr. Bill helps dentists, who are fresh out of school, acquire their own practice. Dr. Bill explains his process, and the steps he takes, from turning a dentist in debt, into an entrepreneur and business partner. [:50] Why do so few people end up entrepreneurs? [1:40] Todd has known Dr. Bill for over 20 years. [3:10] This lifestyle that Dr. Bill has created, does it only apply to dentists? [6:50] Let’s talk about the basics. How does Dr. Bill find opportunities? [10:35] Why should you hire someone fresh out of college? [12:30] After year two, Dr. Bill’s entrepreneurs have some skin in the game, and they’re less likely to quit. [17:50] When a business has reached year ten, that’s when Dr. Bill buys out. [21:05] So far, Dr. Bill has bought 18 practices. 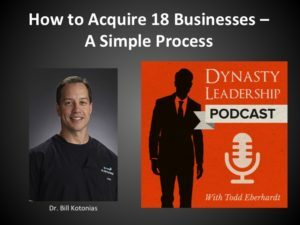 [22:45] In the dentist industry, what is the customer turnover rate from acquiring a new practice? [24:40] When do dentists typically think about selling their business? What age range do they tend to be? [26:25] Todd does a quick recap of how Dr. Bill finds opportunities and purchases them. [28:50] Let’s talk numbers. How much is a single-owner practice that has 2,000 patients worth? [36:30] On average, how much profit does Dr. Bill see, at the end of the day? [41:25] What happens to the staff when a transition is taking place? [42:55] Final thoughts from Dr. Bill? What makes this industry work so well is finding the right entrepreneur and the right opportunity.